The parish registers held at Shropshire Archives for Bishop’s Castle and surrounding parishes alone would take up more space than could be spared at BHCRC, so the decision was taken early on in the planning stages of the Local History Centre project to take digital images of the registers, which can be viewed on-screen, and required pages printed. This has the advantage that researchers can view an image of the original document, with no risk of transcription errors, and of a much higher quality than existing microfiche images. 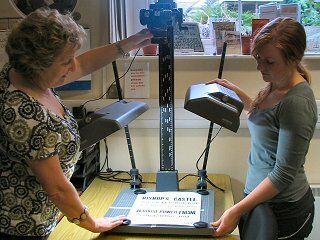 Volunteers were trained in the use of a high quality camera and stand at Shropshire Archives, and similar equipment was bought for use at BCHRC. When all the pages of a register have been photographed, the RAW images are converted to PDFs and stitched into a continuous document. 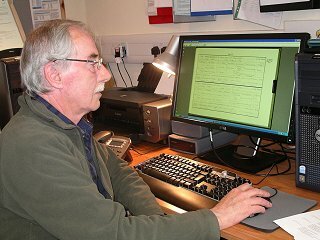 Shropshire Archives staff carry out some of these processes, and are always on hand supervising and advising volunteers. A large screen enables the images to be viewed at a legible size. The copyright of the images remains with Shropshire Archives.